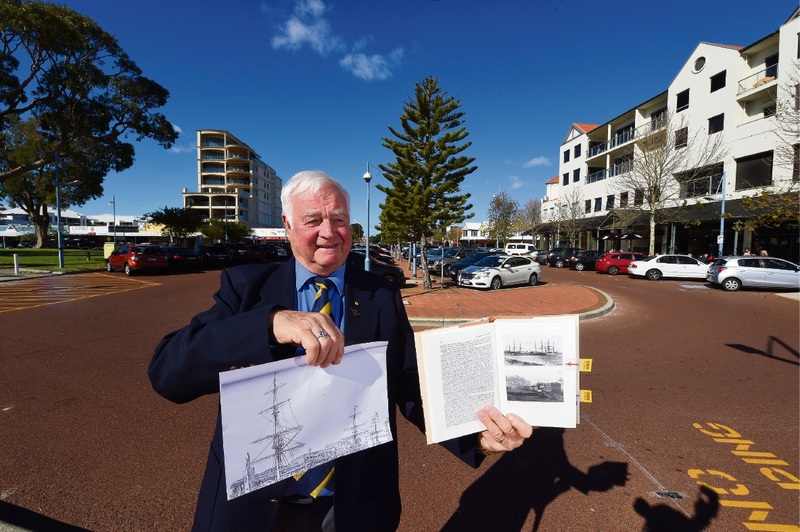 Allan Hill with sketches of the mast project on the Rockingham foreshore. A VISIONARY project to recreate old Port Rockingham along the foreshore has been proposed by former mayor and Palm Beach Rotarian Laurie Smith. Mr Smith and another former Rockingham councillor, Allan Hill, are keen to see up to seven full-sized replica masts of old sailing ships, including the Rockingham, which used to visit the city, installed along the edge of Churchill Park. Mr Smith said the project would pay tribute to the vital role the Rockingham played in helping to establish the fledgling WA colony and portray the way it looked in the late 19th century. “Between 1860 and 1910 the colony of Western Australia was a basket case,” he said. “We think it would provide a huge economic boost for the area,” he said. “It would also give Rockingham the profile it deserves. Mr Smith said the masts would be made of solid steel and cost between $40,000 and $80,000 each and would be funded by businesses and individuals. “We want to make the residents aware of what we’d like to see happen and involve the land and business owners in that area to satisfy the historical promotion of the city,” he said. The project was first proposed in 2002 but did not proceed because of a lack of enthusiasm from City of Rockingham at the time. One of the masts being considered would be a replica of the Catalpa sailing ship, made famous by its dramatic rescue of six Irish Fenian prisoners who escaped from the Fremantle Prison in 1876. “When we did this project in 2002…the Catalpa Association in Boston indicated they would probably be prepared to pay for their mast,” he said. The Rotary club engaged well-known marine artist Ross Shardlow to do some sketches of what the vista would look like. Mr Smith said Mr Shardlow was keen to be involved in an advisory capacity if it was supported by the community. Mr Smith said he was working on a timeframe of about six months to see if the project was viable. He was hoping to get some support from any tech-savvy community members to create a three dimensional animated video to visualise what the finished project could look like to help promote it.